When I was in Kathmandu, Nepal in January 2014, I went to a shop called Local Women’s Handicrafts, and I met Nasreen Shekh. 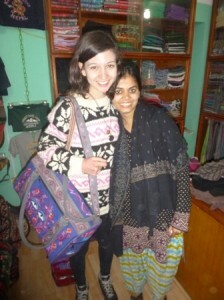 A friend of mine, Beth Collins, had been told about Nasreen’s shop by another Australian. On the program, the two of us had seen a lot of gender discrimination and women living in impoverished conditions. Beth had been told that a young woman had set up Local Women’s Handicrafts to help disadvantaged women. When she told me this, I was eager to find the shop and meet Nasreen. On our last day in Kathmandu, Beth and I went to find Local Womens Handicrafts. When we did we were so excited to meet Nasreen. We explained how we knew about her shop and she warmed to us immediately. She told us her story and we learnt all about her home village, her past experiences and her reasons for setting up her business. Although I had seen a lot of sad things in my time in Nepal, talking to Nasreen was the first time I cried as a response to gender inequality. Up until that day I had only felt disheartened. In Nepal, women are very much second class citizens. Men are the breadwinners and women look after everything else. The women are intelligent and multi-skilled, but these skills are valued much less than men’s. Men are most important. Women exist to serve them. Women’s interests and wellbeing are not cared for. Women work hard and they suffer from poor health. The availability of services like health care is considered unnecessary and an individual’s education depends on their ability to pay. In families, these inequalities exacerbate the fact that boys are treated better than girls. If parents cannot afford school fees for both their daughter and their son, they will send their son to school and put their daughter to work. This type of discrimination exists all over the country. When I met Nasreen Shekh I didn’t cry because I was shocked or sad. On the contrary, I was touched. Her determination to make a difference was a glimmer of hope at the end of a very saddening trip overseas. When Beth and I spoke to Nasreen, she told us about how she had come to Kathmandu to make a life for herself, and for other women. She told us how much she cared about helping women become economically autonomous, and how she had received a huge amount of criticism for giving women jobs. She told us how her mother had said to her: ‘I wish you never had been born.’ In her voice she showed fear. She was worried about what she had done and what her family would do to her. In traditional Nepalese culture Nasreen’s actions are considered criminal. All I saw however, was potential. When I met Nasreen Shekh, she gave me hope for the future of Nepali women. While I was there, I made sure to exchange contact details. I wanted to help her achieve her dream and I wanted others to hear about the amazing work she was doing. Since coming back to Australia, I have kept in contact with Nasreen over email. She has been updating me with her progress and I have been helping her set up an online business to sell her products. Her website (www.localwomenshandicrafts.com) is still under construction, but her story is worth hearing. Her story is genuine, and she is a truly beautiful individual. Tell me about your family background and your home village. I have no idea when I was born, but my school gave me a fake birth date. When my teacher asked me my age, I told him I didn’t know when I was born. He put my birth date down as 11/11/1991. I am now 23. I am from a very conservative family, where being a woman means you are a life-time slave. Once a girl turns one, she is treated very harshly by her mother. I remember when I was two years old, I was very sick. My mother was counting the days till my death. But I was lucky. A doctor gave me an injection and I started to recover. I think my parents were disappointed. In my village there is a huge difference between the value of boys and girls. Boys only do ‘nice’ things. Even if he is really bad, a boy will be treated as a great person. But if a girl makes a tiny mistake, her punishment will be huge. When I was very young my Mother would tell be to go into the forest and collect wood. If I could not find any I would get very scared. In my village women have boundaries. When you are child you do as your parents say, regardless of how hard. When you turn 11, your parents start arranging your marriage. At 16 you are forced to marry, and then to have a baby. One after the other. That’s just how it is. Women just accept this and lose all their confidence to do anything else. A woman’s job is to serve her husband. You can never say no. This is the position my sister is in and she is struggling. She got forced into marriage when she was 16. She is now 26 and has four children. She has never done anything for herself and has always been controlled. Now she lives in constant fear. A lot of women in Nepal rely on their husbands’ or families’ income. What prompted you to start a business and become economically autonomous? I remember when I was around 11 years old, my parents were starting to plan my sister’s marriage. I thought she would be excited but she wasn’t. She was crying all the time. She pleaded to our mother to not make her get married. I was asking her, ‘why are you are sad? You must be happy! You are going to another house where you will have enough food to eat and you will have a husband who will love you’. I was unaware of the reality. After a month of being married, my sister came home asking desperately if she could stay. She explained that her husband had been drinking. That he always drinks. She said he would come home at 11 o’clock at night and demand that she make him a fresh dinner, give him a massage and put him to bed. She was less than a slave. She would work all day and most of the night. She would only eat food that was left over from meals. She pleaded to escape. But my mother told her she could not help. She told her she had to go back to her own house and obey her husband. My mother said that if she dies obeying her husband, then that is her destiny. Can you tell me a bit about your business and how it started? After deciding I did not want to end up in the same situation as my sister, I pleaded to my brother who was going to the city to work to take me. I told him: ‘I will make your food, clean your laundry.’ He said no at first but I didn’t give up. I would call him and call him and ask take me to the city. Eventually he gave in. He brang me to Kathmandu. When I got here, I was surprised to see women working in shops, wearing clothes very different to in the village. I was very excited. For a while I just lived with my brother and another man he worked with. It worked well until the man stole all of my brothers money and everything he had. That’s when my brother told me I had to go back to the village. He said he could not support me any longer and that I had to go home. I was very sad about this. I thought I would end up like my sister. But sometimes miracles happen… That night a dog chased me on the street and a tall white man came running after him. I was very scared until he started apologising in Nepali saying ‘I am really sorry my dog made you frightened.’ I felt a glimmer of hope at that moment. I grabbed his hand and in one breath asked ‘can you save my life!? Can you teach me English?’ He was stunned, but he told me he would come. After two long days he came back. He took me to a book store and bought me books. He gave me money for me and my brother. After this we continued to live as before. The one difference being, I was now working as well as my brother. I wanted to help bring in money, so I asked him to teach me how to work. He agreed and we were very happy. One day when I went out to buy some vegetables, I saw a woman wearing a very similar dress to mine. I went over and noticed that she spoke my village language. I made conversation with her and she told me that she had run away from an arranged marriage. She said she came to Kathmandu with her boyfriend to escape; but as soon as she became pregnant her boyfriend left. I got very excited and asked the woman if she wanted to work with me. It started off as the three of us, and soon developed to six. When did you open Local Women’s Handicrafts? Was there a specific event or opportunity that made you open the shop? Before we started the women’s handicraft business we were working for a big factory. We would do all the hard work and they would give us very little pay. Sometimes we would get no pay. They would say that our work was not good. We decided to look for our own shop. The little English I had learnt from my teacher allowed me to do this. One day I met a group of people from Canada. One of the women was particularly interested in what we were doing, so I told her my story. She was amazed! She told me that I didn’t know what I was doing. At first this made me very scared. I thought maybe I was doing something very bad. But she told me the world is proud of people who do work like this. To be honest, Heidi, I did not know what I was doing. I was just listening my heart. I had no idea whether it would work. I didn’t think I was doing anything special. But my Canadian friend thought so. She took my story and published it in a magazine called Forbes. I had no idea what is Forbes. Since then I’ve been in a very bad position. I lost my tiny shop, I lost my factory, I was desperate, and very sad.The landlord wanted to build a new building. He told us we had to move. My Canadian friends told me it would be ok. Forbes gave us $US1000. Unfortunately buying a new shop would cost $US2000. I thought all was lost. But I was deperate, so I took Forbes’ $US1000 and went to a finance company and told the man, I have $US1000, can you give me $US1000 in loan? I told him if I didn’t repay him, he could have my shop. He was hesitant, but he eventually gave me the loan. I bought a new store and started making things like before. The women have come to work with me, and we are getting bigger everyday. Since then, people have told me I am a bad girl. This really hurts me, but I always think from my heart. I say to myself that I am not bad. I am helping women with my shop factory. How have women in Nepal benefited from your business? My main dream is to stop the control over women’s lives. Women need freedom. I think when women are independent, they are very close to being free. My workers get paid for the pieces they make. If they make 20 pieces they have 20 pieces of money. I respect all the women. I was like them once. I feel bad for suffering women. I think about how they could be me. I try to give women control over their life. What do your family think of you and your business ? My family? I have no idea what they think. My brother appreciates what I do but my parents are not proud of me. They think I am destroying their reputation. But I still I help them. I give them money. I think they must be happy, but they just don’t want to say. As a woman you have achieved an amazing amount through breaking social norms. By choosing to start up a business instead of getting married and having children you have achieved economic autonomy and freedom for yourself and for other women. Do you think you will ever get married or have children in the future? Is there any way to do this without giving up what you have worked for? I will only get married if I find a person who knows women’s value. Someone who treats women as real human beings, and who promotes peace, love and happiness among women and men. If I found person like this I will get married; but I would die before I would accept a forced marriage. What are your plans for the future? – For the businesss and for yourself? I hope we can save many womens lives, but not only women’s lives, also men’s. If women are smart, men will eventually be smart too. I think if a mother is smart, she can save her children. A woman can make her children good people. If all women do this, they will change society. I think if women are free, everything will be peaceful and happy. The world will smile. This entry was posted in Featured, World and tagged featured, feminism, nepal, world. Bookmark the permalink.